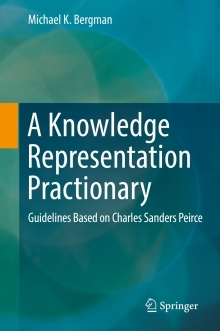 After resolving some technical glitches, Springer has finally made available my new book, A Knowledge Representation Practionary: Guidelines Based on Charles Sanders Peirce, in paperback form. The 464 pp book is available for $24.99 under Springer’s MyCopy program. 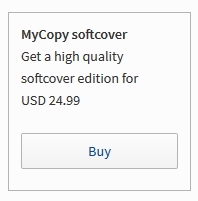 MyCopy is available to SpringerLink subscribers who have access to the computer science collection. Most universities and larger tech firms and knowledge organizations are current subscribers. 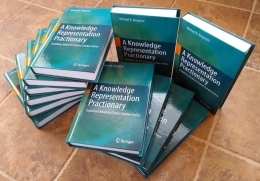 You should be able to login to your local library, go to SpringerLink, and then search for A Knowledge Representation Practionary. If you are a qualified subscriber, you will see the image to the right on the results page. (If you are not a subscriber, you should be able to find a friend or colleague who is and repeat this process using their account.) After choosing to buy, you will be guided through the standard transaction screens. Though only printed in monochrome, my figures render well and the quality is quite high. The cover is in color and the paper quality is high. I waited to get a copy myself before I could recommend it. I think the overall quality is quite good. To learn more about my AKRP book, including a listing of the table of contents, see the initial announcement. Also, of course, Springer subscribers have access to the free eBook, and hardcopy and other versions are available. Unfortunately, I think prices are unreasonably high for non-Springer subscribers. Please let me know if you need to find a cheaper alternative. BTW, if you read and like my book (or even otherwise! ), I encourage you to provide your rating to Goodreads. Mike Bergman's new book, A Knowledge Representation Practionary, is now available in paperback.